Freelance Writers Guild of the Philippines (FWGP) presents the monthly open book event entitled, "OPEN (NA OPEN) BOOK" by Dr. Margarita Holmes and Jeremy Baer on July 21, 2012 (Saturday) at 4:00pm. 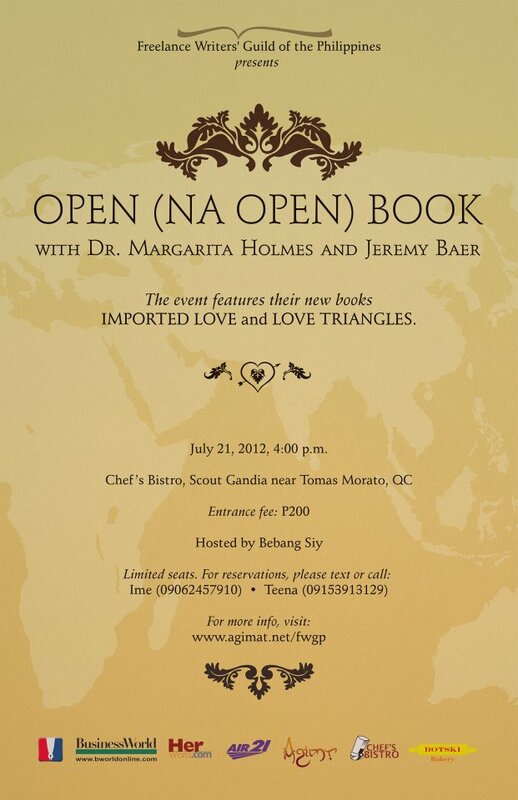 The event features their new books, Imported Love and Love Triangles. This will be held at Chef's Bistro at Scout Gandia near Tomas Morato in Quezon City. Have you ever found yourself (or someone you know) in a love triangle? Do you have an “imported” love? Are “mistresses” and “unfaithful spouses” topics that appeal to you? Do you have taboo love questions you have been wanting to ask Dr. Holmes? Hosted by Bebang Siy, this event is brought to you by: BusinessWorld, herword, Air21, Agimat, Chef's Bistro & Botski Bakery. LIMITED SEATS. For early and sure-seat reservations, you may opt to pay via BPI bank deposit or LBC or Cebuana Lhuillier Pera Padala. Please text or call: IME (+63.906.2457910) OR TEENA (+63.915.3913129) FOR MORE DETAILS.